TAKING OUT 300,000 commercially viable households from the National Broadband Plan tender made it a less attractive sell to other bidders, according to the Secretary General of the Department of Communications Mark Griffin. Speaking before the Oireachtas Public Accounts Committee today, Sinn Féin’s David Cullinane asked if the removal of around 300,000 households from the original tender changed the dynamic of the tender itself. 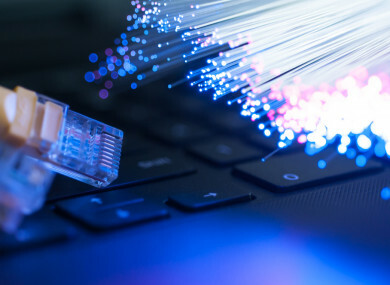 Eir had entered into a contract to deliver fibre broadband to the households, which the secretary general acknowledged today were more commercially viable. Eir subsequently announced that they were withdrawing their bid for the NBP tender process having already rolled out fibre broadband – which is a higher quality, higher speed broadband, to 70% of homes across Ireland – but about 540,000 homes and businesses still remained unconnected (and still are). What company will roll out broadband to the remainder 540,000 homes – households that are less accessible – has become a headache for government, due to only one remaining tender, Granahan McCourt led by David McCourt, in the mix. Tensions around the plan have escalated, due to confirmation that meetings between McCourt and the then Minister for Communications Denis Naughten took place, many of which took place in an informal capacity, with no officials present and no minutes taken. Griffin told the committee today that the State can only intervene when no market operator will provide services. He said Eir made a proposal to the department to roll out services to the 300,000. However, this would in turn reduce the overall scale of the households up for grabs in the original tender. The secretary general said the department consulted with the EU Commission about whether there was latitude for the government to refuse such a deal when it is on the table. He said it was made clear to them under EU State aid rules that the Irish government would have no option to decline the offer. Cullinane said it would appear that the decision to do so seriously compromised the viability of the project, possibly fatally. “Rural Ireland has suffered as a result – with significant consequences in terms of investment, growth and viability. We need, therefore, to get to the heart of the decision to change the tender in 2016 and why it was taken. “Public oversight demands that we do so,” he said. On the meetings between McCourt and Naughten, the secretary general said he did not recall telling the communications minister at the time that some of the meetings being held might not be appropriate. He said he was not aware of any private meetings between the two men. However, he added there were meetings held with other bidders also, such as Eir on 23 January where Griffin said officials told the CEO that the company was being premature in walking away from the tender. Separately, a discussion on the Smyth report into the National Broadband Plan and meetings between David McCourt and former Communications Minister Denis Naughten took place at the committee. Also today, the secretary general was asked by Fianna Fáil’s Marc McSharry whether the department should be focusing on the roll out of 5G rather than fibre broadband to the home. Griffin said a recent Comreg report said that 5G is not a substitute for fibre, and is merely “complementary” to fibre. McSharry questioned which would be more cost-effective, seeing as the NBP costs appear to be spiralling. Griffin said to get 5G coverage to 99.5% of the country, over 6,000 additional masts would be needed, and would cost around €1.8bn. Email “Removing 300,000 homes from original broadband plan 'made original tender less attractive'”. Feedback on “Removing 300,000 homes from original broadband plan 'made original tender less attractive'”.